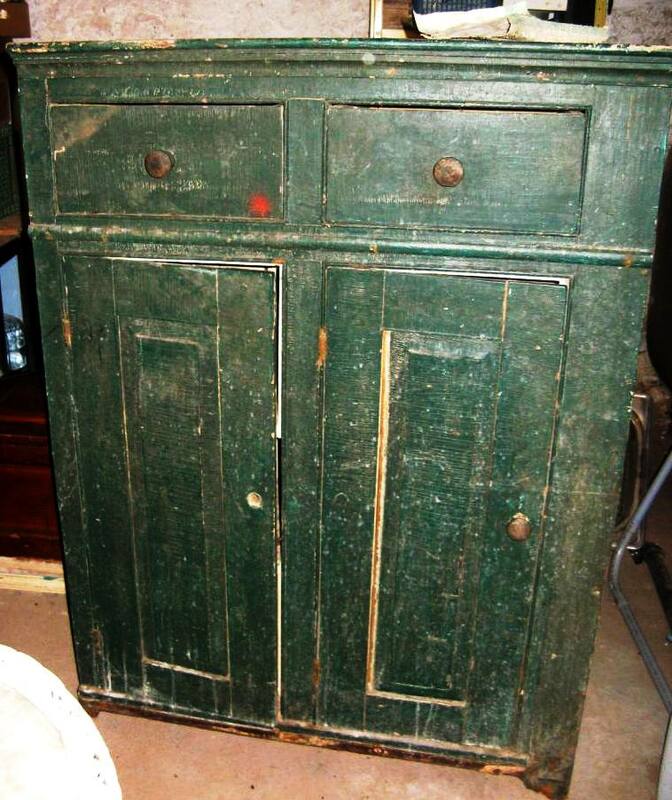 Recently, I was asked my opinion on how to best “gentrify” this quite dirty old cupboard owned by Collectivator dealer Dana Hergott, of the Ojiibik collections. I’ve cleaned hundreds of cupboards over the past thirty five years so I thought this info might be of wider interest . I asked Dana if she would mind me including her photos, questions and results while conveying the information here, and she generously agreed, so over this, and a couple more entries I will make my suggestions for the restoration of this fine old piece, report on her progress doing the work, and eventually show the finished result. My response, My gut feeling is to go with what you’ve got. Actually that’s my default position unless it is obvious that there’s something better underneath, or it’s just so ugly the way it is that it must be changed. Also, one can never be sure what one will encounter under the top paint, and there can be some very unpleasant surprises. I find the green quite attractive actually, and it’s got a nice “crackle” going on between the green and the light grey underneath. Poor thing. It does needs some help, doesn’t it. The feet, the cut off side trim, not to mention the upside down right door, all need fixing, but not to worry. The first stage is easy enough. Clean it thoroughly using Murphy’s oil soap (or other) Inside and out. If the top or other parts are quite raw, with paint missing try not to get these areas too wet, using damp, soapy rags followed by damp clean rags. This so as not to raise the grain on the raw wood. Otherwise, wherever there is a good layer of paint, and especially if it is filthy, you can work much wetter, even using a hose outside on a warm sunny day. Power washers are tempting, but they can really screw up the surface if you are not very careful and use them on there most gentle settings. Of course in this Canadian winter the best one can hope for is a warm, well lit, garage, or the like, so you have to work drier. Now, you have to do what you have to do to get it clean but try not to over scrub or clean too thoroughly, and importantly try not to let it stay wet for too long. Have lots of dry rags (old towels are great) around to wipe it down as you go. Keeping a fan or heater blowing on it helps too. I find it best to clean the inside first , paying mind not to let drips stand too long on the bottom boards or doors. Then clean one section at a time starting on the top and working down. Always conscious of wiping down the drips. On very greasy surfaces it may be necessary to mix a little T.S.P. (tri sodium phosphate) with the soap and warm water. But this mixture is to be used only where necessary, and sparingly, followed with the straight soap and water rinse. A strong TSP solution has the potential to leave lighter bleached out marks where it runs down a surface, so be careful how you use it. If possible it’s best to soldier on and clean it all in one session so it all dries at the same time . But if it’s too much work, then split the two sessions between inside and outside. Remember, the trick is to clean it all to about the same amount. Where the paint is good, you can initially get it quite soapy. Clean a whole section at a time with rags, sponge or a soft bristle brush to the point were it is uniformly “quite” clean”. Not “super” clean. On the really grungy spots you can Use those green, plastic scratchy pads, but go gently. Follow this with a rag clean up and damp cloth rinse. Keep going over it with dry rags as it dries. When it’s dry buff the surface a bit and your done this first stage. I’ll follow soon with “Part two – Fix it”, but for now I need to go down and make supper. We take turns depending on who feels like doing it. Tonight I do. Good luck with it and let me know how it goes.